On Friday 28th September, the team at Water Direct hosted their first Macmillan Cancer Support Coffee Morning. Hosting the event was a great way to get everyone together whilst raising money for a worthy course. Macmillan offers support to those suffering with cancer and the money raised ensures the funding of more nurses, social workers and support centres to name just a few. Our total is now in and we raised an amazing £349.02 for the charity. We had a great array of cakes on offer, from home bakes to store bought favourites. The winner of the best bake had to go to our Quality & Compliance Manager, Daniel Bashford who managed to recreate one of our tankers in cake and fondant form. The tanker cake seemed too good to just dive in to, and seeking a further way to raise funds, we decided to auction it off to the highest bidder. 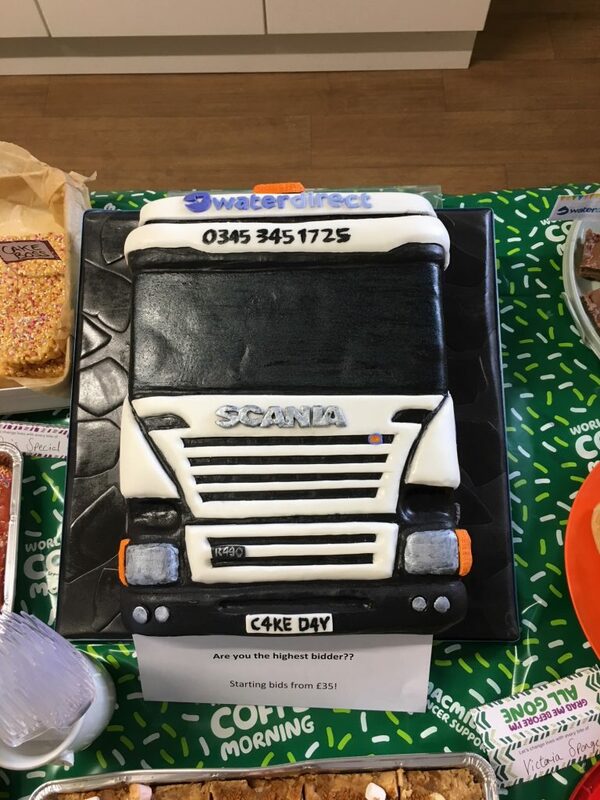 In the end the tanker cake alone raised £100, adding to what had already been raised through cake and tea sales, as well as through a guessing game of ‘Guess the Length of the Veggie Roll’. As companies across the country start sending over their donations, Macmillan’s total raised for the year continues to grow. In just two weeks, the total has already reached over £3 million and counting. Through businesses and groups like us who have come together to host these coffee mornings, Macmillan can continue to provide vital care to those in need. It’s great to see so much involvement for such a worthy cause and we can’t wait to get involved again next year.